So what was the offense? Depicting Muhammad? 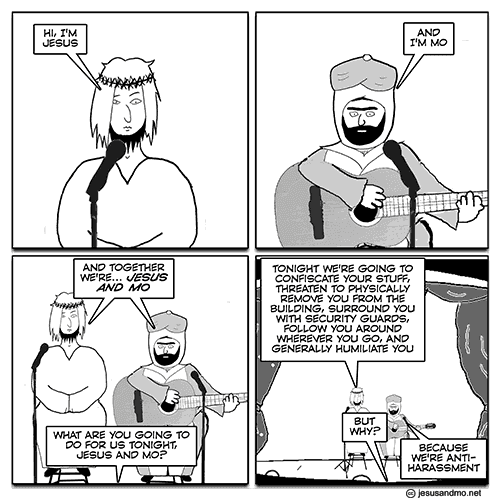 Anyone who reads the comic knows that its a satire of religion, not a pointed attack on Muslims. And anyone who works with multiple faith (and no-faith) group ought to acknowledge that there is a serious difference between targeting individuals and targeting their bad ideas. I suspect the "offense" here was simply that other students were offended and complained. It appears that the school officials deemed this sufficient to give the students wearing the shirts the option to remove them or be expelled from the event. This is not surprising, given that many religious believers do not make the distinction Hemant draws (i.e., criticizing individuals vs. criticizing their bad ideas). I imagine the students who complained were the sort of religious believers who did not recognize this distinction. If the school's action bothers you, check out this petition that has been set up to provide them with a bit of feedback about the issue. Also check out what Notung wrote about why we should wear banned t-shirts. As I read Hemant's post, I found myself gripped with an odd sense of deja vu. Taking offense at a silly t-shirt and equating it with things like discrimination…why did that sound so damned familiar? And then it hit me - it is not just religious believers who do this stuff. Remember the t-shirt Dr. Harriet Hall wore at TAM and the reactions she received? Some atheists took offense and equated wearing a t-shirt with harassment. At what point should we stop caving in to people who can’t handle fair criticism of their beliefs? Now. Now is the point at which we should stop caving in to those who refuse to tolerate criticism of their beliefs. Hemant is right that this is the question we should all be asking. Bad ideas, whether they are religious or not, must be criticized. And as long as we are criticizing ideas, we cannot let ourselves be dissuaded by misplaced howls of discrimination, harassment, and the like.